BACON CHEESEBURGER LOAF RECIPE | Keto One Day At a Time. Combine the meats, eggs, bread crumbs, ketchup, seasoned salt, and Italian seasoning. Divide in half. Form one half into a loaf and place it in a treated casserole dish. Place sliced cheese on top, leaving an inch border all the way around on the outside. Put the other half of the meat on top of the cheese, and press down on the edges to seal. Drape bacon over top of the meatloaf, overlapping slightly, and tuck the ends underneath. Bake at 350 degrees F. for 90 minutes or until you get an internal reading of 160 degrees F.
Let the meatloaf rest a few minutes before slicing. The rule of thumb is to cook meatloaf 30 minutes for every pound of meat. 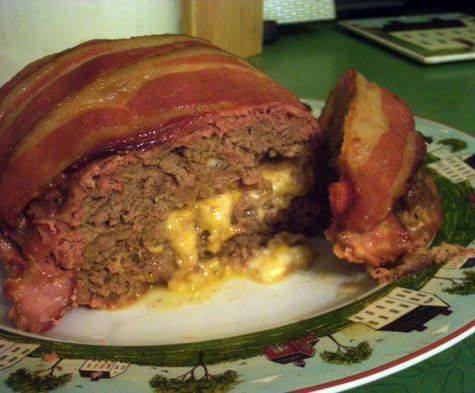 A new twist on an old classic, enjoy this bacon cheeseburger loaf recipe tonight! This entry was posted in Uncategorized by NataleeEmbry. Bookmark the permalink. LCHF meals can be made deliciously!